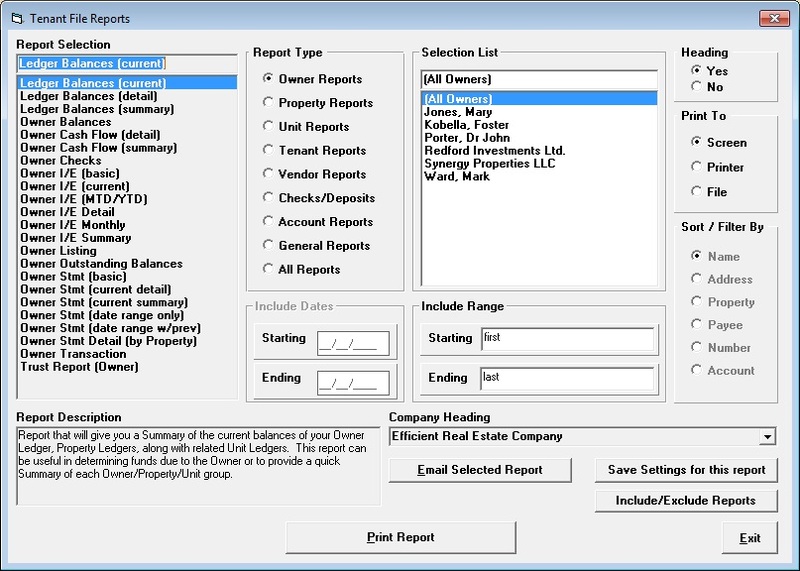 Easily choose and print one of the numerous reports in the Tenant File! There are numerous reports in the Tenant File, and each one can have it's own settings. All financial reports are date sensitive, so just enter a starting and ending date, and you can report on any date, week, month, quarter, or year! The reports can be printed to screen, printer, or a file. Just click on the report you want, and press 'Print Report'. You can also limit reports to a specific range if you wish. The 'Report Type' options allow you to choose the main report categories. Then, all of the related reports are listed on the left side for you to choose from. Below that list, you'll find a description of each report and it's contents. Many of the reports can be emailed as an attachment, such as your owner and tenant reports. Just click the report that you want and choose the 'Email Selected Report' button. You will be taken to another screen where you can personalize the email or select certain email recipients. There is even a 'Save Settings' button for each report, so that you can save your report dates and other settings saving you time the next time you run this report.